Remember that the Friends and Family deal is good only for the rest of today. So make sure to take advantage of it! Enter ONFRIENDS at checkout to get 30% off. Mmm, Jcrew is always worth the money though (provided you have it). I'm always disappointed by the quality of Old Navy's sweaters. 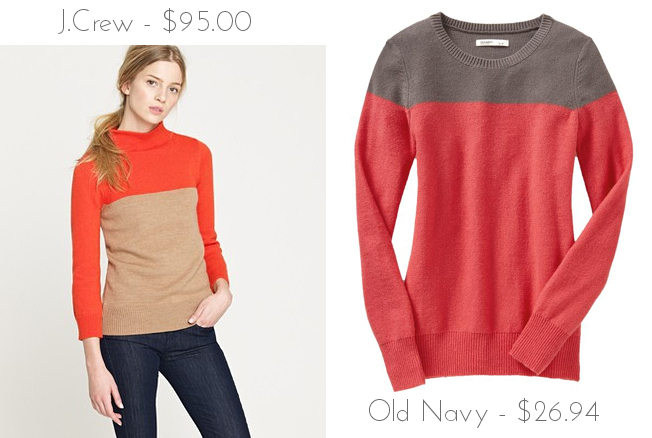 I think I prefer the colors of the Old Navy version, myself, but I love both! Definitely a great look for less! I bought this in store over the weekend, and it was actually marked as $20, with a final cost of $14 with the F&F deal! I'm so glad you posted this! I looked at this sweater in J.Crew the other day but wouldn't even try it on because of the price tag. 35% Off All Gap Brands: Today Only!